I love finding really neat ways to finish raw edges. 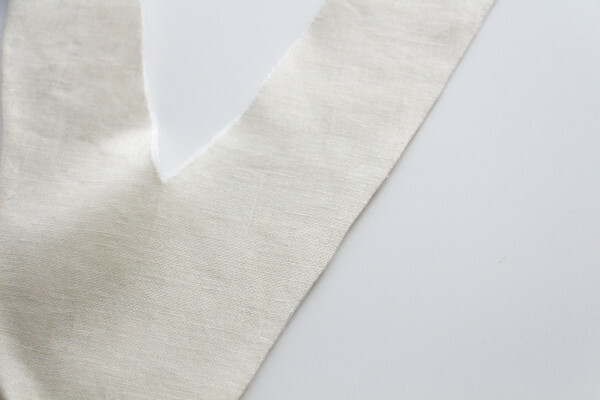 So while i was developing the Dove blouse sewing pattern, i became really obsessed with experimenting with different ways to finish the raw edges on a facing. 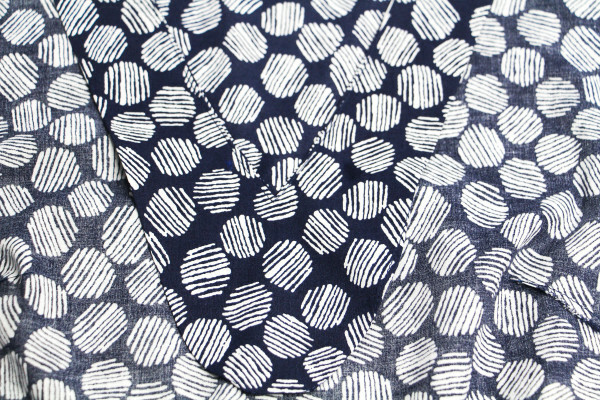 In the end I found that I like different methods for different looks, and couldn’t decide on one perfect method (typical) so I used a different method for each pattern variation sample so that i could show you all how to do them too! 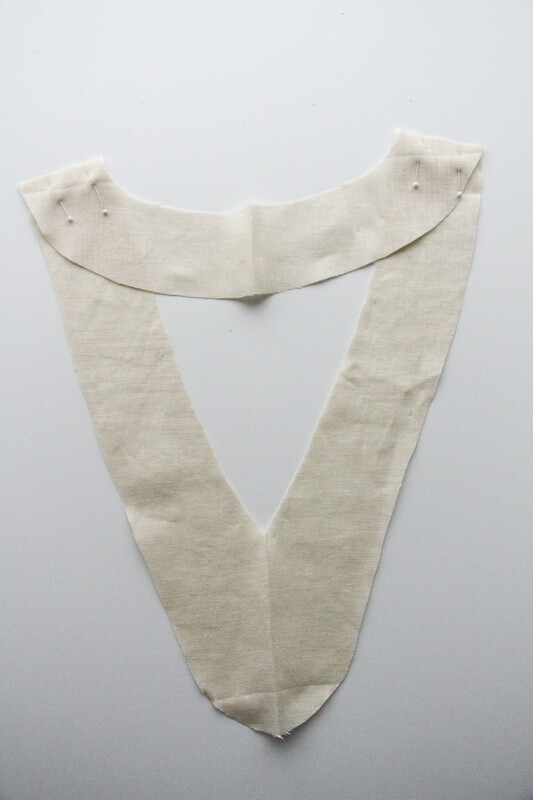 So today I’m going to show you three different ways to finish the raw edges of a neckline facing AND three different ways to secure the facing to the blouse so that it doesn’t flip out to the right side of the garment (i hate that). 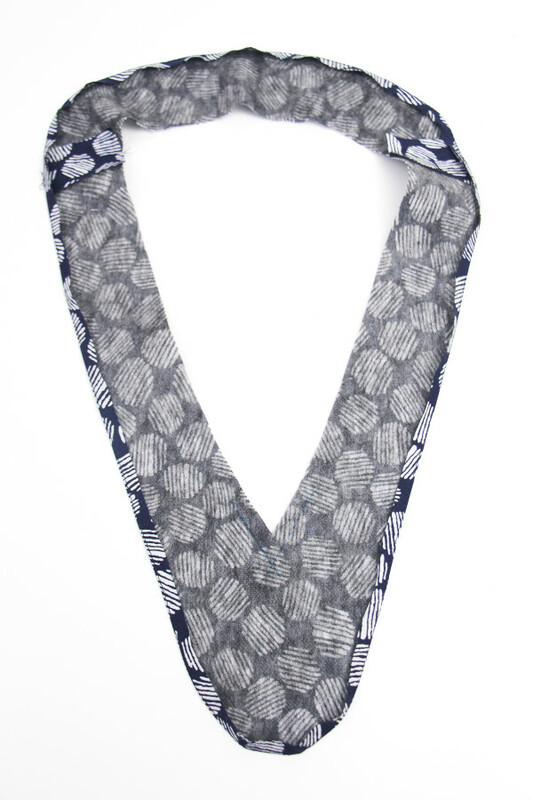 The first method i’ll be showing you is covered in the pattern instructions, it’s basic, it works well and is neat. 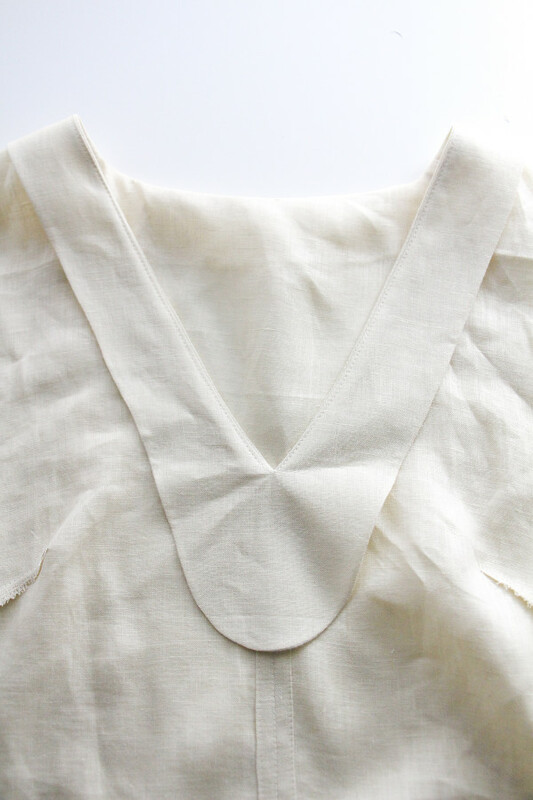 I like this method for a more casual blouse, like the one above which is made from linen. The downside of this method is that the topstitching is visible from the outside of the garment, and though the raw edges are neatened, you can still see them on the inside, which i know will make some sewers heads explode. 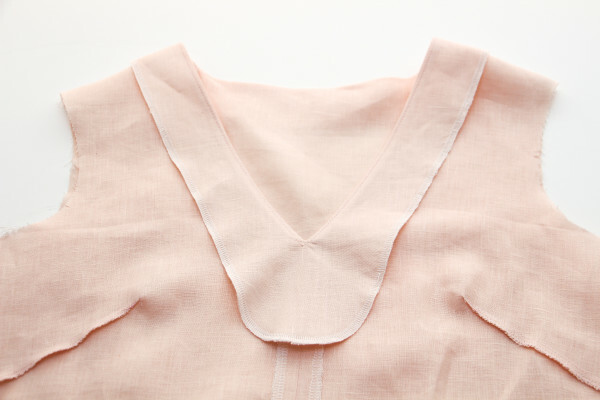 This method is the one i covered in our last tutorial on how to sew a neckline facing. 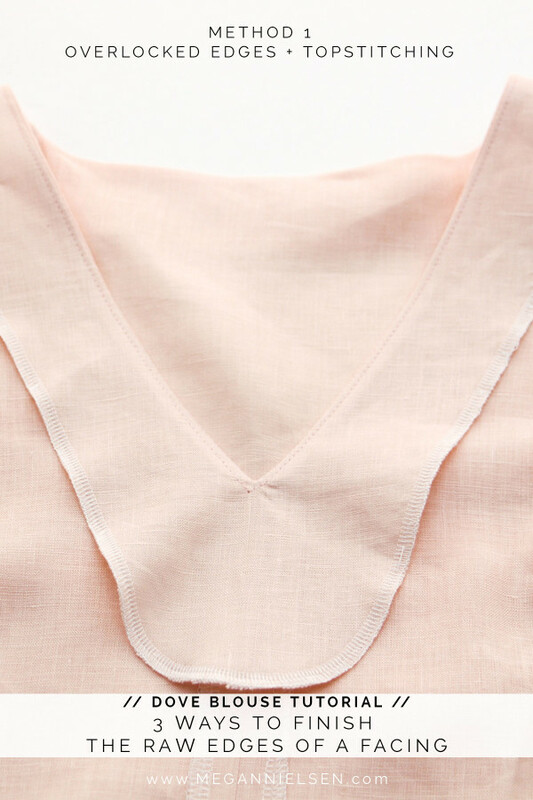 The idea is pretty simple but if you need a refresher, here is the tutorial for how to sew the standard neckline facing. 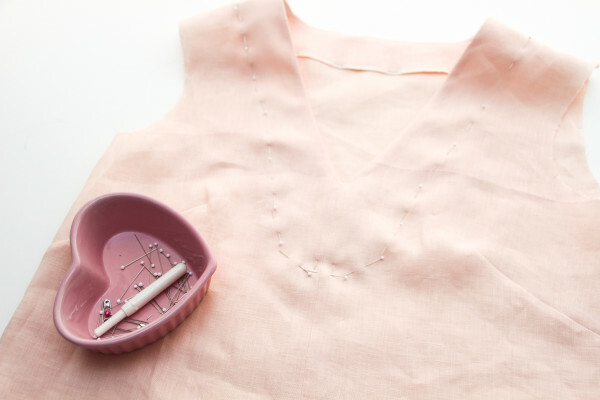 You simply sew the facing to the blouse, neaten the raw edges with an overlocker, zig zag stitch, binding or whatever you like, then careful pin to the blouse and topstitch all the way round. Voila, you are done. The second method is by far my favourite method. 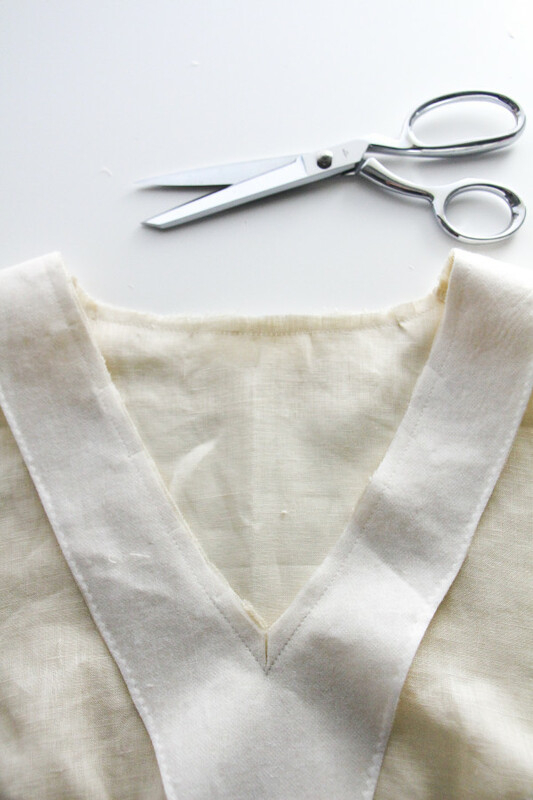 This method involves a little more work, and some handsewing, but results in a near invisible finish on the outside of the blouse, and a very secure facing that won’t move a muscle. 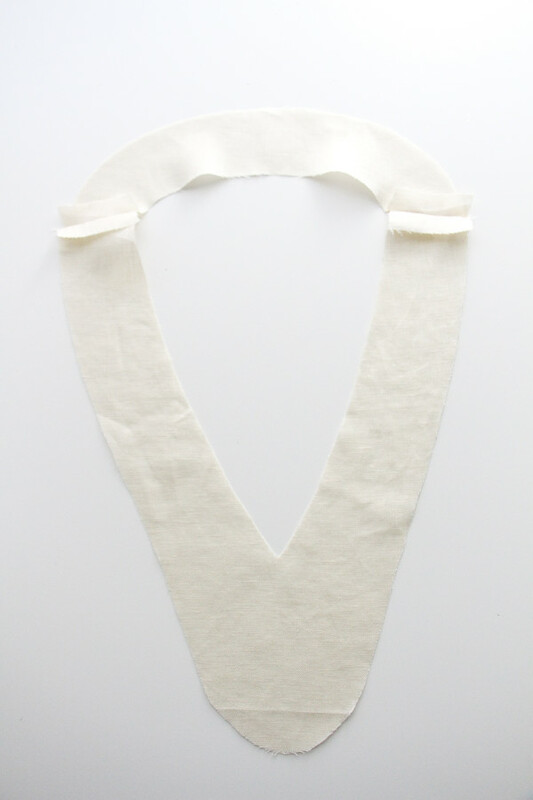 Firstly you attach the interfacing to the wrong side of the facing, and sew the shoulder seams together. I recommend block fusing, check out how to do it using this tutorial. 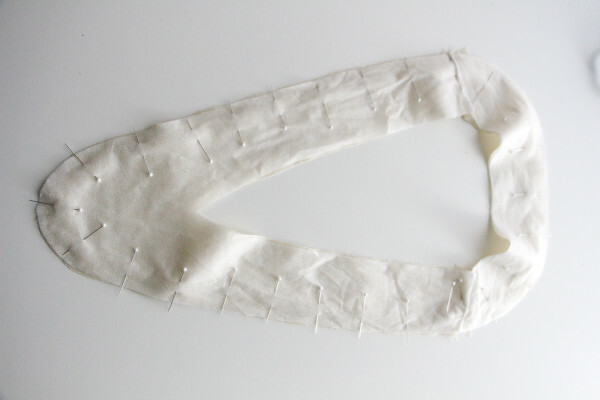 The next step is to sew a line of basting stitches 1/4″ from the raw edge all the way round the facing edge. 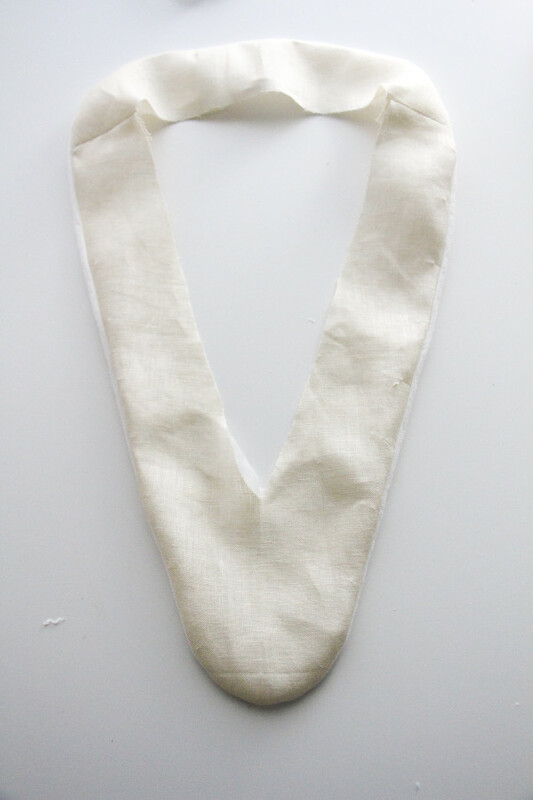 Don’t forget to mark the V of your neckline, that will help you later. 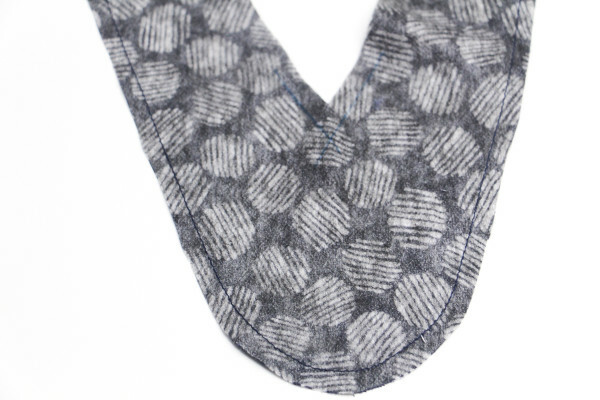 Using your iron, carefully turn in the raw edges along the line of stitches and press. Go slowly and you’ll be able to make the edge nice and clean and curved. 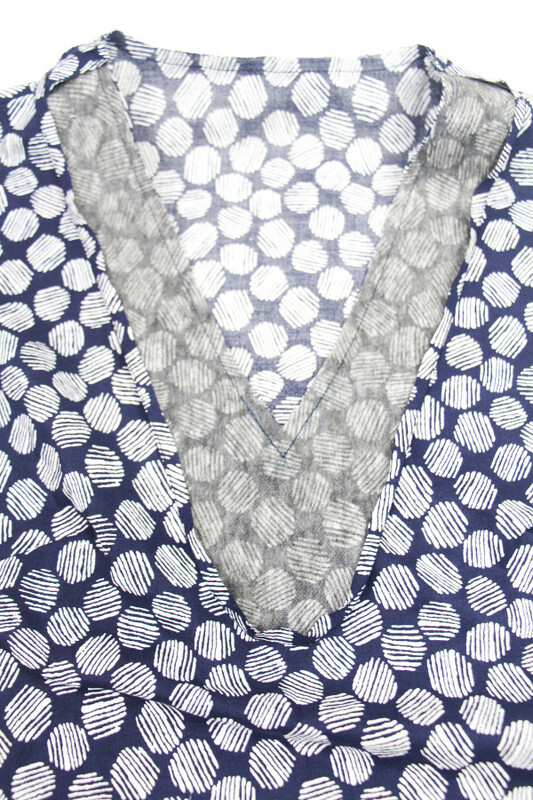 Place the facing and blouse right sides together, then attach your neckline (see the detailed tutorial). Carefully pin the facing in place, making sure it is lined up correctly and very straight, no pulling. 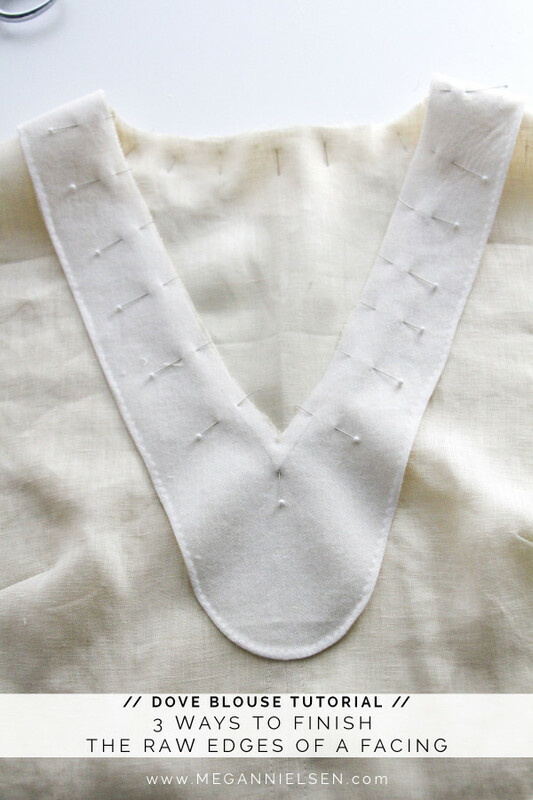 Next attach the facing to the blouse using a slip stitch. 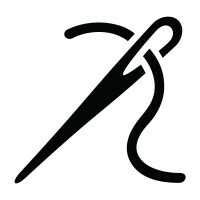 For more detailed images on how to sew a slip stitch, check out this tutorial. 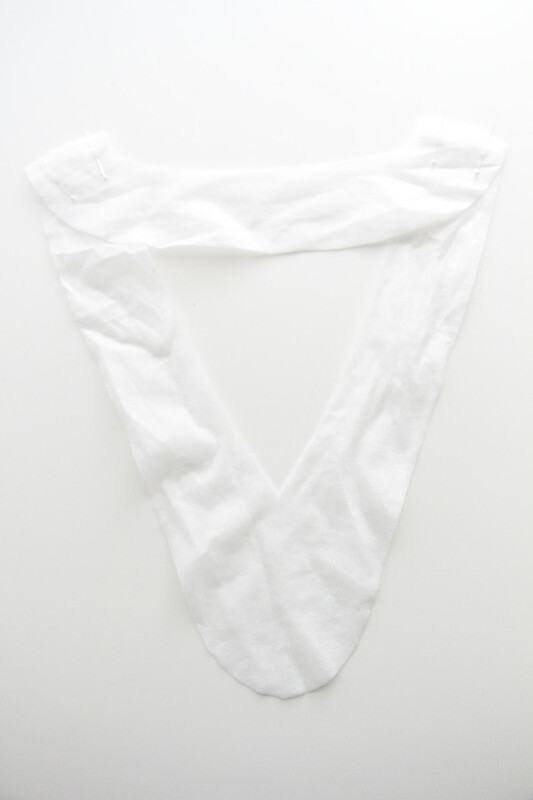 Basically you will be taking in only a thread or two with the needle on the right side of the garment. This last method is really cool. 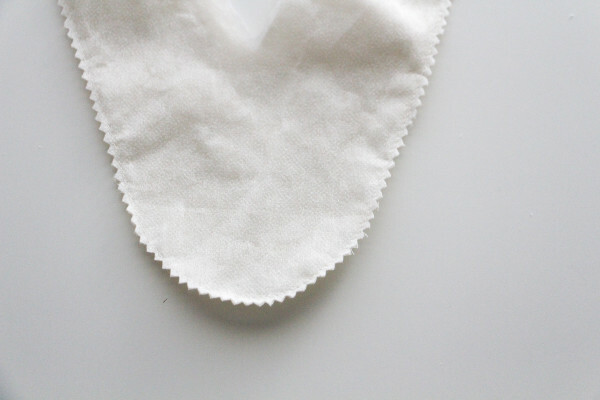 It involves using the interfacing to hide the raw edges of the facing. It’s a little more fiddly, and you need to think about it before hand, but it results a really lovely clean facing. For this method, DO NOT BLOCK FUSE. I put that in capitals, because if you’re like me and you block fuse everything, then you need a bit of extra reminding when you do something different! 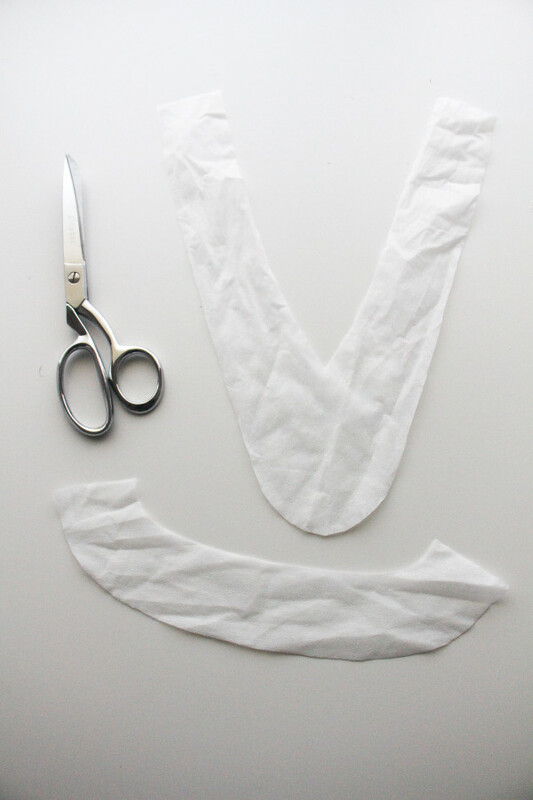 Cut your interfacing and facing separately. Sew the shoulder seams together. Place the facing and the interacing right sides together. This is going to feel weird, but do it. 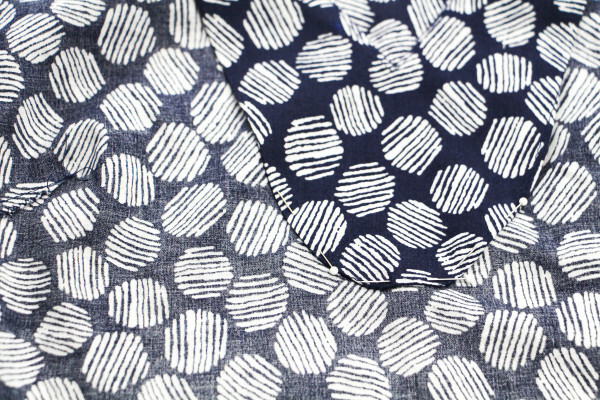 The right side of the interfacing is the side that will face outwards, the smoothish side. 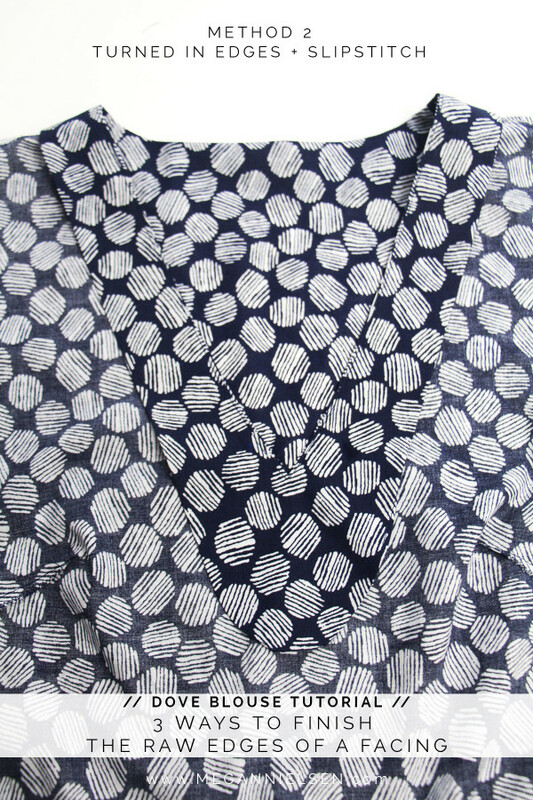 The wrong side of the interfacing (shown facing outwards in the above picture) is the side with the glue on it (you can tell because it feels a bit bumpy and shines a little in the light). 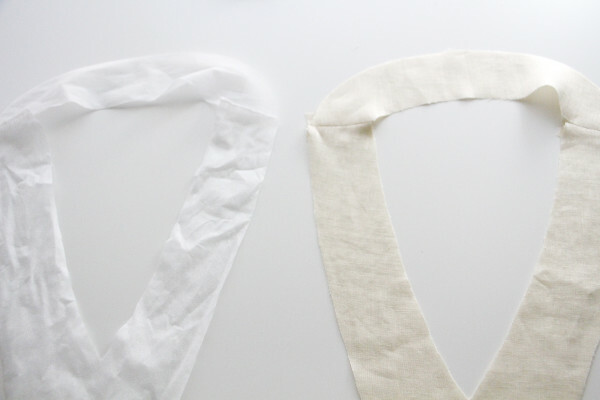 Sew these together around the outer edge. 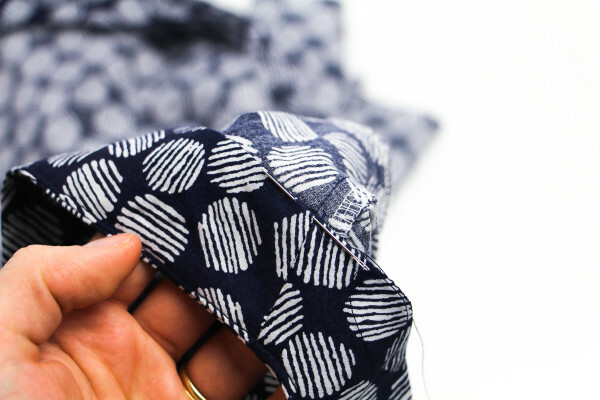 I used a 1/4″ (0.3cm) seam allowance. Grade back the seams or use pinking shears as i did. 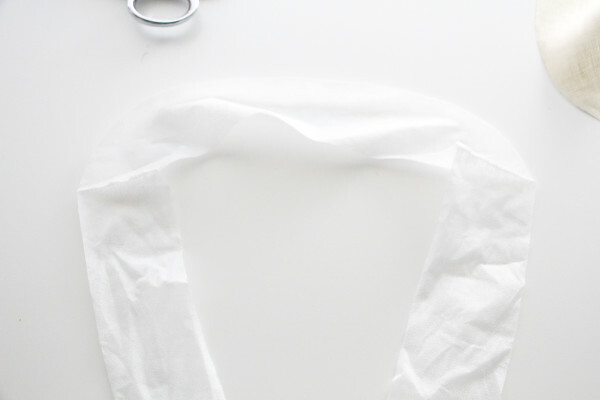 Now turn the facing and interfacing a round so that the right sides are facing outwards. Use your hands to help shape the curves of the facing, and make everything as flat and neat as possible. 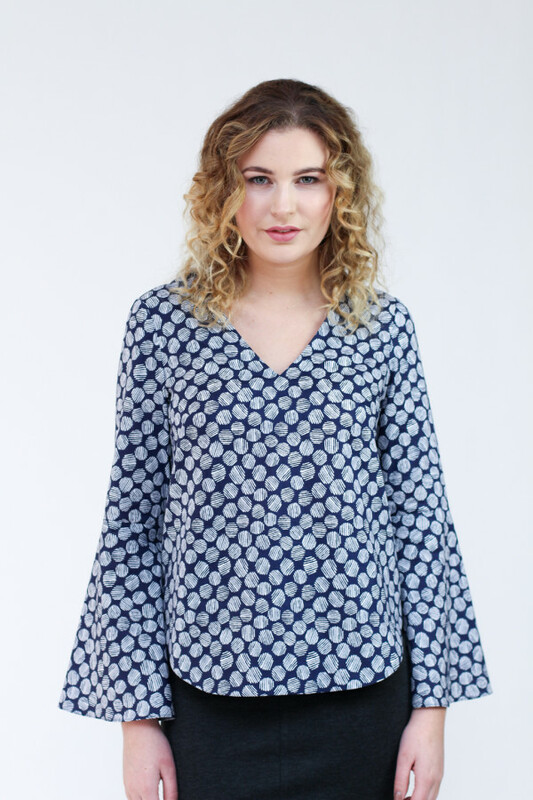 Line up the neckline edges and shoulders etc. 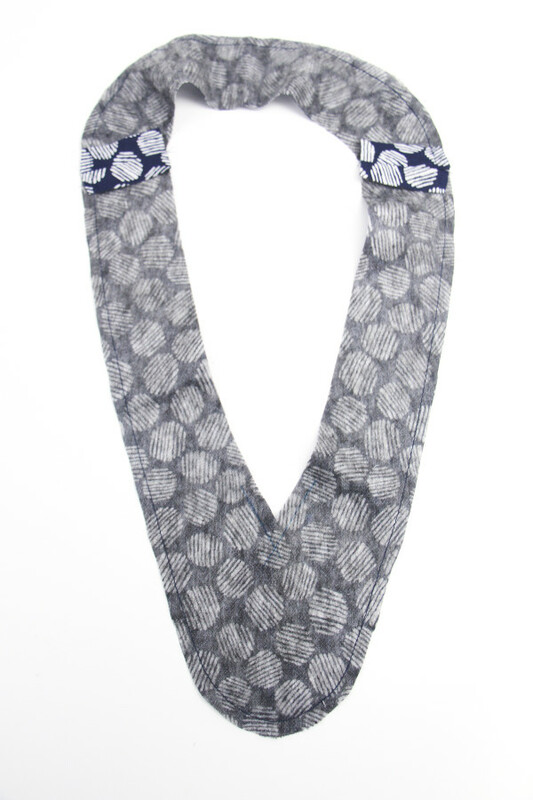 Using your iron press the facing and interfacing together. The glue will fuse them, and your raw edges are now all enclosed! 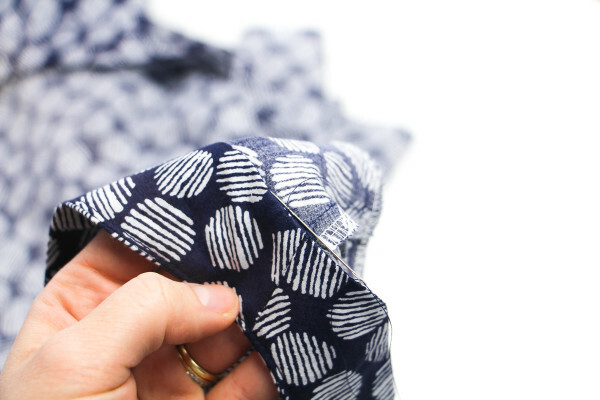 Place the facing and blouse right sides together, then attach them together (follow the detailed tutorial for this step). 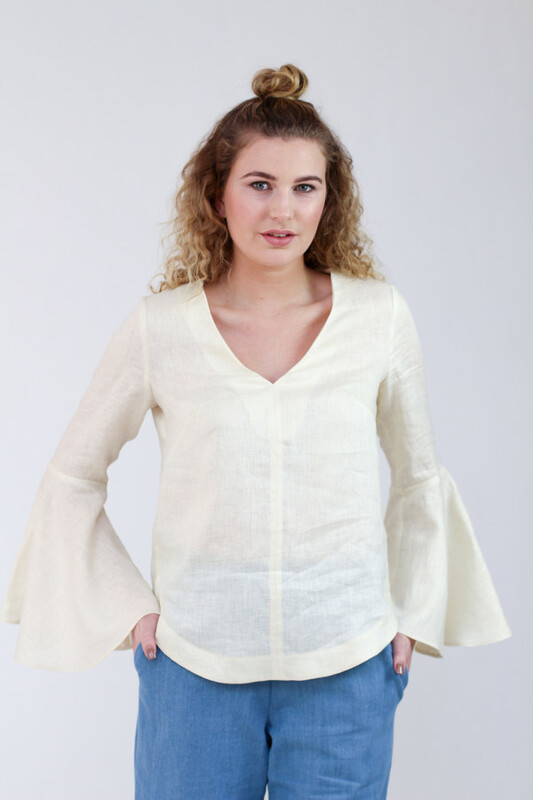 Once you’ve turned your facing to the inside of the garment and pressed the neckline well, you can secure the facing to the blouse at the centre front seam and shoulder seams by tacking in place by hand, or sewing “in the ditch” down the seam lines on the right side of the garment. There you go my dears! 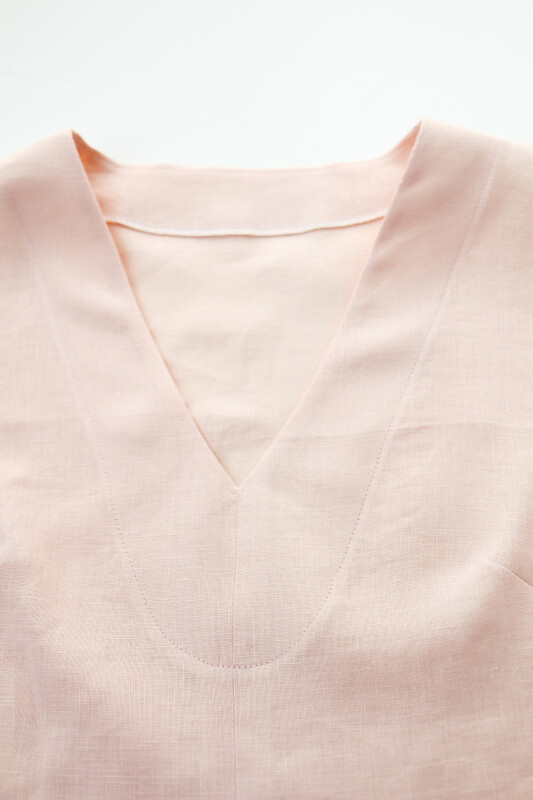 3 different ways to neatly finish the raw edges of a neckline facing AND 3 different ways to secure a neckline facing to your blouse! 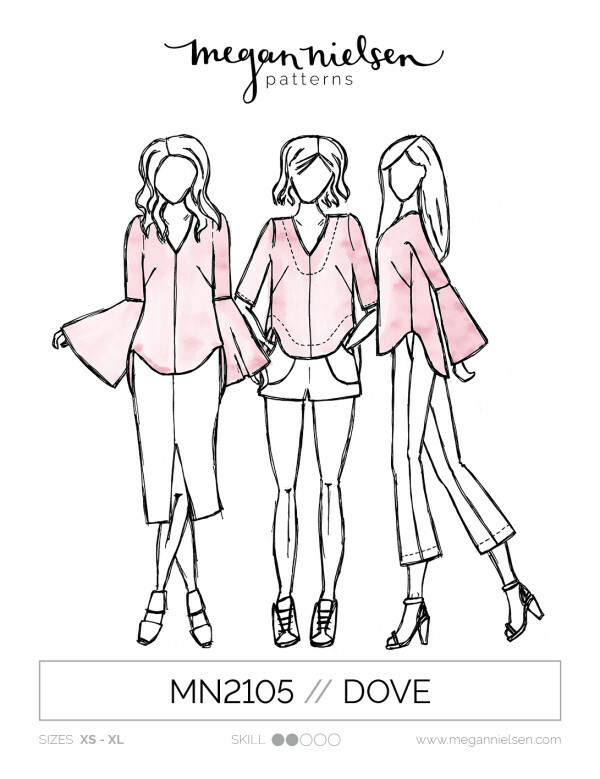 Stay tuned because next up I’ll be showing you how to attach cuffs to the Dove blouse (for versions 2 and 3 in the pattern). Method #3 is genius!! As a lover of facings I’ll definitely be doing them that way from now on :-D Thanks for the excellent tip!